This article has been contributed by Guillermo Elenes. With more and more cities in California grappling with displacement and rising rents, and with 45% of residents renting, it’s time to implement serious policy solutions to stabilize communities. The myths abound on rent control policy and prevent cities from pursuing what is really a moderate and reasonable regulation of the largely unregulated private rental market. Unless you think landlords should be able to raise rents however much they want, whenever they want, you believe in rent control and should consider adopting it in your community. Why not just build-baby-build instead? Trickle-down housing policies don’t work. Co Star, a real estate research firm, reported that of 370,000 multi-family rental units completed from 2012 to 2014 in 54 metropolitan areas, 82% were considered “luxury.” Luxury housing is the new “market-rate.” Building housing for high-income people attracts more high income people, rather than lowering prices to levels affordable to low and moderate income people. In a gentrifying market, demand typically far outpaces what can realistically be built. High-income renters don’t just go for newer units, they demand older units too, and are able to outbid lower-income tenants.4 Many cities without rent control are seeing higher rents on older units and new units are unaffordable. Rent control doesn’t work like it should because it is undermined by state laws like the Ellis Act and Costa Hawkins Act. Through Ellis Act evictions, thousands of rent-controlled units have been taken off the market and converted to condos. The Costa-Hawkins Act prevents rent control from protecting condos, single-family homes, rentals built after 1995, and allows landlords to charge market rate for new tenants (called vacancy decontrol). The Harvard Law Review singled out vacancy decontrol as a reason for landlords to harass current rent-controlled tenants in order to make more money on new tenancies. In 2000, the journal of the American Planning Association in 2000 cited vacancy control as essential to preventing displacement. These shortcomings aren’t the fault of rent control, but of a State legislature where one of the biggest donors to political campaigns on both sides of the aisle is the California Realtor’s Association. There are 13 cities in California that have had rent control on the books for decades. The laws have stood the test of time and stood up to court challenges. With rising rents and displacement, more cities are taking a second look at rent control and strengthening their laws. In July 2015, the first city in 30 years to pass a new rent control law was Richmond, CA in the San Francisco Bay Area. San Diego has just cause for eviction on their books, and tenants are clamoring to add rent control policies. Alameda, Santa Rosa, San Mateo, Burlingame and San Jose tenants are pushing for stronger protections. Momentum is building for this popular policy, and that is not just popular: it’s necessary. 1 Alston , Richard M., J R Kearl, and Michael B. Vaughan. 1992. “Is there a consensus among economists in the 1990s?” American Economic Review 82(2): 203-209. 2 Arnott, Richard. 1995. 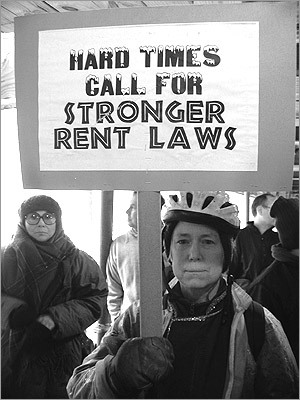 “Time for Revisionism on Rent Control?” The Journal of Economic Perspectives Vol. 9, No.1: 99-120. 3 Forbes, Jim, and Matthew C. Sheridan. 2004. “The Birth of Rent Control in San Francisco.” San Francisco Apartment Magazine Online, June. www.sfaa.org/0406forbes.html. 4 The Harvard Law Review Association. 1988. “Reassessing Rent Control: Its Economic Impact in a Gentrifying Housing Market.” Harvard Law Review Vol. 101, No 8: 1835-1855.